Ford Co-Pilot360 is offered with the Edge ST. This is a package standard driver-assist features that offer ample protection to everyone in the SUV. Ford Co-Pilot360 offers automatic high-beam headlamps, Pre-Collision Assist with Automatic Emergency Braking (AEB), a Blind Spot Information System with Cross-Traffic Alert, a Lane-Keeping System, and a rear view camera. 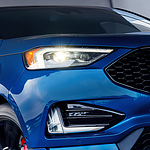 The 2.7L V6 turbocharged EcoBoost engine powers the Edge ST. This engine can reach 335 horsepower and 380 pounds-feet of torque. The Edge ST also comes with a low center of gravity that offers enhanced cornering capability, improved body control, and precise steering.